Cable ties would be my idea for fixing the cradle to something other than the front forks . So much for weather forecasts. Nary drop of rain this morning. I could have done the Cycle Derby North Sportive, but them again, the wind was wrong for it and the first rider I saw on Strava to have completed it called the ride "Brutal". I only did 36 miles today because the updated forecast of 50% chance of drizzle turned out to be 100% Deluge. So I cut short my plans. Of course as soon as I get home the skies clear and the more than moderate breeze drops light too. Ho-bloody-hum. Nice ride out at midday, don’t think I have ever seen so many squirrels on a ride. Nut time I guess. Also think the local swallows have gone south now. Better get my log order placed. I don't think that would work well for a slim tube and a bottle cage. Needs to be quite rigid so there's no risk of fouling the back wheel. Might be worth a try, though. Leg has been put in a soft cast and it will remain encased for the next 4 weeks so no driving never mind cycling. I can work from home but 4 weeks will drive me stir crazy. Missed this Dom. What have you done? Ah, embarrassingly I mis-kicked a football and managed to tear a muscle in my thigh! Not all French are good footballers then, encouraging to know! Here's the weekend, I could quite easily do 25 miles or so and I don't even feel like it. Cold and gloomy out there. Same here, cant bring myself to go out, cleaning out garage and packing away garden furniture for the winter. According to some papers the winter is going to be another Beast. Charity ride next weekend so will be doing a 65 miler come what may. According to some papers the winter is going to be another Beast. Yeah, right. They can't even forecast from one day to the next. I'm convinced that the exercise is helping my knees to recover so I forced myself to go out for a bit. I took the original Boardman, thinking that there might be the odd puddle. I wasn't expecting rain until 2:30 - 3:00pmish. However ten minutes after I set off at about 11:30 it did start to rain very lightly, and it continued on and off for the rest of the ride. Cold out there as well, but I wrapped up warm enough. Almost every other cyclist I saw today had tights and long sleeves on. I'd intended to do 26 - a modest increase on my present maximum range - and I'd planned a Twycross route of more or less exactly that distance. However I realised a few minutes after I set off that I'd ignored my own plan. I set off along Heather Lane on autopilot, rather than out of the village toward Alton Hill. So it fell to me to mentally extend the route by a couple of miles to make up for my mistake and contrive a distance of roughly 26 miles. I decided to take in Sibson, which extended the ride a bit. 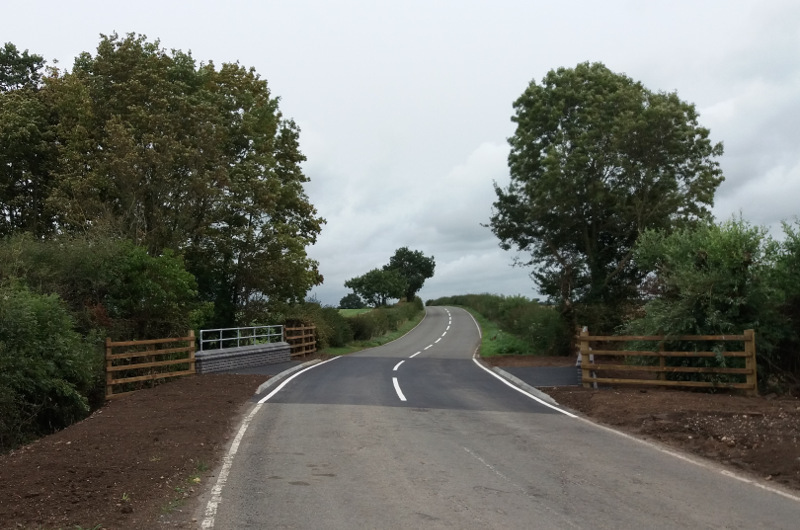 But when I reached the A444 I decided I'd head along Gibbet Lane - the road works were due to be complete, and I wanted to take a look. And what a cracking job they've done. I have no idea why it was necessary, but there's a nice little wall on either side of the road over the stream now. 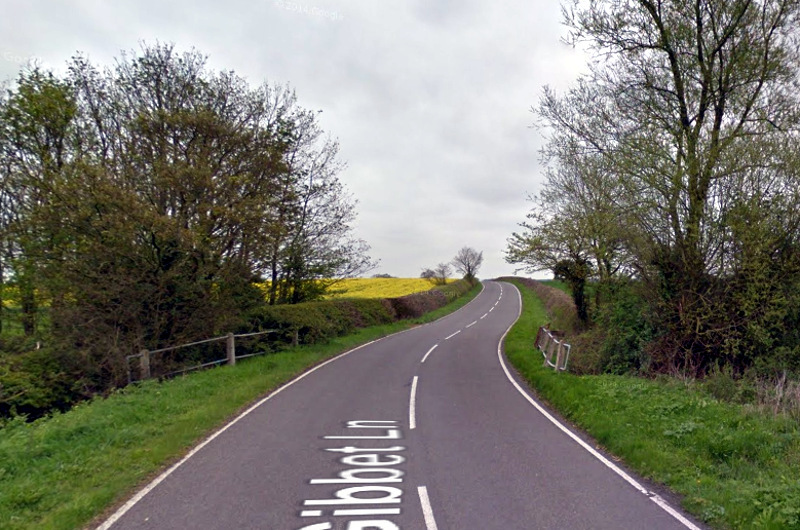 The consequence of taking in Gibbet Lane though rather than going through Bosworth was that, once again, I'd shortened by expected distance on completion. So after Shackerstone I decided to go through Burgoland and Swepstone, and from there do most of my old lunchtime route. I thought that would see me arriving home after 26 miles or so, but in fact as I pulled up at the garage, I'd done 28.60. A bit of right knee pain kicked in after 16 miles, which is a definite improvement. The left one started to feel uncomfortable after 23. They both feel a bit hurty now but I'm sure they'll be fine in a day or two. I'm getting there. Despite the rain I really enjoyed that one, despite my initial reluctance. Blasted out the chain and derailleurs with GT-85 when I got back, but it was due a relube anyway. I think I'm on course for at least one Fondo before the end of the year.